This episode introduces multiliteracies to students. They gain experience in applying the placebased multiliteracies framework to materials associated with the story of the Lewis and Clark expedition as told from tribal and nontribal perspectives. How is perspective communicated by designers? Why are particular designs and tools selected to tell a story? Tell students that for this lesson they will be taking on an “eagle eye” perspective. The Merriam-Webster Online Dictionary defines “eagle eye” as “the ability to see or observe keenly.” Explain that an eagle might experience the “place” where it lives through a variety of senses—such as seeing, hearing, moving, smelling, touching, and tasting. Make a copy of the photograph of the bald eagle flying with its head oriented downward. Display the copy so that all students can view it, such as with a document camera. 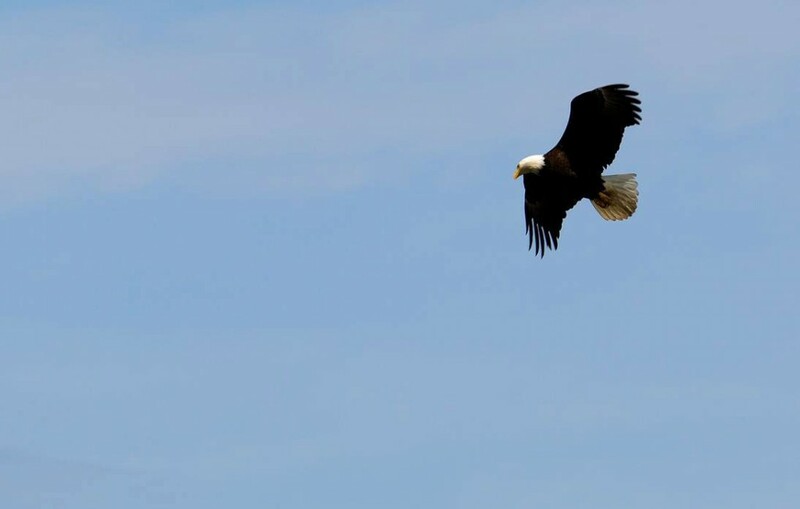 State that Lewis and Clark reported seeing bald eagles along their journey. The eagle could have seen and observed both the expedition members (a perspective representing “from the river”) and the tribal members (a perspective representing “from the riverbank”). An eagle could have observed from high above or glided down to take a closer look. It could have come in from the east, the west, the north, or the south and observed the scene from multiple perspectives. Have the students close their eyes and imagine what the eagle in the photograph would have observed. For example, imagine the expedition members in a canoe on a river with tribal members watching them from the riverbank. What would the eagle see? What would it feel? What would it hear? What might it smell like? The teacher might describe a windy fall day when the expedition members are maneuvering their wooden canoes down a river through rough rapids. The water is splashing on them and they look cold and wet. A canoe gets hung up on a rock (John Ordway journal record, October 14, 1805). Members of a tribal community are on the riverbank talking to each other wondering who these strangers might be and why they have chosen this day to travel down the river. The tribal people on the bank are dry and dressed in warm clothing. They are surrounded by fish racks and the smell of drying fish. Move through the scene slowly allowing students ample time to imagine their surroundings through multiple senses using an “eagle eye” perspective. Explain that, as a culminating project, students will be using an “eagle eye” perspective to design a new symbol for the Lewis and Clark National Historic Trail. They will be using multiple senses to learn about and represent the views “from the riverbank” and “from the river”. As they look at events through multiple perspectives, they will be involved in a process of “bridge building” between different cultural groups. Learning about design and elements of place will give them the skills they need to create a new symbol that brings together multiple perspectives. Provide a second demonstration of application of the multiliteracies framework to the text used in Episode 1, Lewis and Clark Road Sign Symbol. Point out that for symbols the focus will be on the following design modes: visual, spatial, movement/gestural, spiritual, and combinations of these. Give each student a copy of reproducible 3-1, “Multiliteracies Observation Log for Symbols.” Demonstrate how the observation log for symbols and the associated “eagle eye” perspective can be applied to the road sign symbol. Talk through your thinking so that the analytic process is made explicit. Give students another copy of reproducible 3-1, “Multiliteracies Observation Log for Symbols” and the two related texts, National Lewis and Clark Bicentennial Logo and Logo Description. Instruct the students to form small groups who will work together to analyze the Logo using the multiliteracies observation log as demonstrated. Give each group a piece of poster paper and colored marking pens. Instruct students to copy the organization and words associated with the multiliteracies observation log on their poster. Next, they will record words associated with the Logo on sticky notes containing descriptive words that will be placed on a large piece of poster paper next to the place and/or design modes where the word(s) best fit. After students have agreed on placement of particular words, they will write the words on the poster. When finished, each student group will place their poster on the wall and share their responses with the whole class. Note that there is not necessarily one “right” answer for categorization as various words can be associated with multiple design modes. Remind students that as a culminating project, they will be creating a new symbol, inclusive of both tribal and non-tribal perspectives, that could be used by the Lewis and Clark National Historic Trail. They will be applying concepts from the Honoring Tribal Legacies Place-Based Multiliteracies: Student Guide in designing the symbol. Have them place all Episode 3 materials in their Trail portfolio. Students apply the place-based multiliteracies framework to additional materials Students look up a key word using a thesaurus and find four more words with a similar meaning. Provide additional examples demonstrating application of multiliteracies Extend focus on vocabulary by comparing and contrasting words associated with multiliteracies. Students complete the multiliteracies observation log for a symbol.